More than any other NBA team — more than the Lakers, even, for once — the New York Knicks' 2012-13 fortunes have been bandied about incessantly this summer. With a respected yet aging crew of helpers brought in to offset the losses of Jeremy Lin and Landry Fields in the wake of a strange 2011-12 that seemed to feature three or four significantly different versions of the Knicks, we've all had our fun taking apart what this year's model might look like. And, perhaps strangest of all, none of these anticipations seemed to hold former All-Star forward Amar'e Stoudemire in high regard. Stoudemire will spend two weeks with Hakeem Olajuwon in Houston next month. The cost of learning The Dream Shake? $50,000 a week is what we were told. Now, we don't know of Olajuwon is charging Stoudemire full price, but Amar'e plans to get bang for his buck. He said he plans to memorize every lesson so he can expand his game to include one or two go-to moves on the post. Alan went on to remind us that Mike Woodson, the coach of the Knicks that seemed to have so much success with Stoudemire off the court last year and Carmelo Anthony working at the power forward slot, was a teammate of Olajuwon's from 1988-1991. And that the Knicks coach, perhaps wary of a Knicks career spent without his team's second-highest paid player being thought of as second rate, is trying to reinforce the ideal of Stoudemire as a post-up cat nonpareil. He's asked, according to Hahn, Olajuwon to work on Stoudemire's back to the basket game. Of course, developing a post-up routine 11 seasons into an NBA career is no easy task, but Stoudemire might boast the smarts and footwork needed to pull it off. Amar'e busted into this league as an athlete with touch, leaping over others and working a screen and roll game expertly with point guards as disparate as Stephon Marbury, Leandro Barbosa (back when he was run as a point man) and Steve Nash. Crippling knee and scary eye injuries took him away from the game for a spell, but Stoudemire returned as a spot-up player with sound instincts and sustained touch, and was able to adapt as a result. Post-up play has long been considered an old man's game. 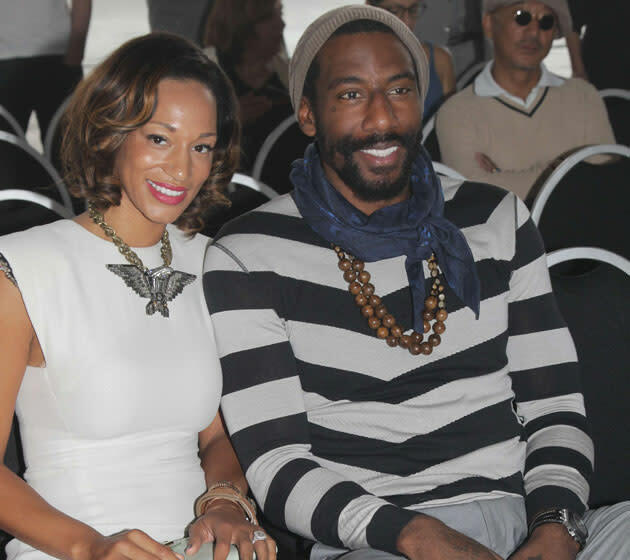 Stoudemire certainly looked the part last season, so why not pair the two? It isn't as if he's lacking in length, down there, either. The price tag is what interests us, as you can tell by the headline. Paying Olajuwon six figures for two weeks of help is a significant investment, and Stoudemire should be credited in this regard. Hakeem once spent his summers banging and learning with Moses Malone, and though he's charging a fee that Moses could only have dreamed of some 30 years ago, his history of getting through to players like LeBron James and Dwight Howard (who, criticism aside, has improved since spending time with Hakeem — the one-time nemesis of former Orlando Magic assistant coach Patrick Ewing) seems worth the price tag. If anything works for Stoudemire, who is set to make nearly $65 million over the next three years of his deal, it will be worth it. Not that this will affect the checks hitting Amar'e's bank account (the amnesty provision doesn't cancel out guaranteed contracts), but the Knicks have already used their amnesty whoopy-whoops on Chauncey Billups, so the 29-year-old Stoudemire will be around until 2015. He's not going anywhere, and though it was pretty clear the Knicks did not play well with him in the rotation during 2011-12, this could change with an orthodox season that doesn't feature lockout-hamstrung practice habits. In shape, and looking to work down low, Stoudemire could help mitigate the loss of a penetrator like Lin and ease Anthony's frustrations; because, for all Carmelo's earned criticism, he truly was out there by himself offensively as the Knicks lost in five games to the Miami Heat during last season's playoffs. Stoudemire was a terrible pairing even with defensive-minded center Tyson Chandler, struggling to stay in front of power forwards and find space in a Knicks offense that seemed to feature him incessantly at the left elbow prior to the trade that brought in Anthony in February of 2011. His 17.7 Player Efficiency Rating was his lowest since that 2002-03 rookie season, and that number doesn't even take into considering his poor on and off ball defense. This bleating on is a long way of saying that it was a rough year. New York's offseason has been a joke, there's no way around that James Dolan-influenced fact. But if Amar'e is taking a six-figure chunk out of his pay in order to become a force in 2012-13? If this previously ignored wrinkle becomes a dependable asset, with Stoudemire drawing fouls and finding room to work amongst Anthony's ball-holding and Chandler's presence? Especially in the playoffs, matching up against Eastern power forwards that fall short of Stoudemire's 6-10 frame? It only took six months of play for us to completely dismiss the idea of Amar'e Stoudemire, Game Changer. Perhaps six figures worth of pay could change this. How cool would that be?